Why do I quilt? Why do I feel the need to cut apart perfectly good pieces of fabric into substantially smaller pieces of fabric and then sew them back together into larger pieces of fabric again? It sounds crazy when you put it that way, doesn't it? 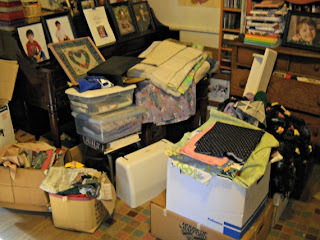 Even crazier, one of the main reasons I do quilt is for therapy from everyday life. Last night at dinner, my two oldest sons had a spoon wrestling match over the potato spoon. Then, Levi decided to eat his whole piece of chicken right off his fork, caveman style. The youngest entertained himself by dropping small pieces of potato in his "big boy" elephant handle cup of milk. My husband helped out by burping over and over and over again. Yes, I need some tranquility after that. Do these kind of events happen in other homes, or just mine? 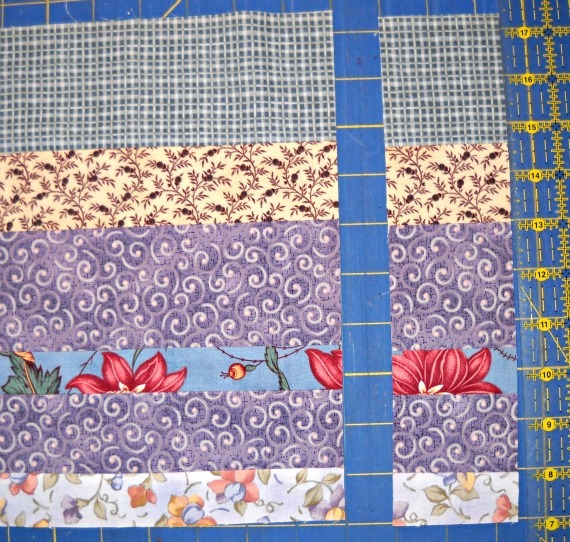 Did the original maker of the above star block stitch for a little sanctuary from everyday life? Do you? I almost finished sewing this purple plaid sleeve to the back of the vintage star block last night, after all the ruckus, while sitting on the porch, the sun setting through the trees across the street. The two younger boys were playing in the yard (Yes, my kids do play outside!). My oldest was kicking the soccer ball with my husband. A much nicer scene after the dinner hubbub. I live in an ancient farmhouse. I wonder if past generations of women sat stitching or playing music on this same porch ages ago while the children ran, played, and caught fireflies in the dusky evening light of fall. 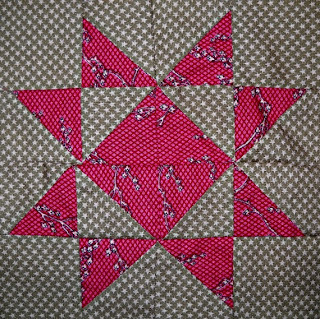 Another vintage quilt find, waiting to be finished. I also quilt for personal expression. I feel a primal inner need to create something. Something that is unique and personal. Something I can share with family and friends that says "This is me", "This is my story". This vintage quilt seems to tell a story about some one's life. 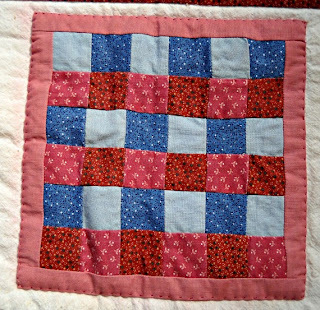 And I quilt for love. Love to wrap up my family in. It's like being there to hug someone, even when you're not there. Warmth, comfort, and love. Even the cats want a little quilt to curl up in on cool evenings. When I tuck my boys in at night, we always end with "a quilt to keep the love in". Good-night. Excuse me...I have to go clean up the cat food and rocks the 2 y.o. just used to fill up a matchbox cars carrier case...time for more therapy! Last Saturday we attended the Spark Con street festival in Raleigh, NC. 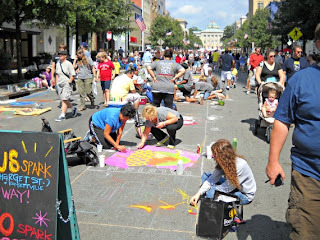 This was a really great art festival. It had a little bit of everything, music, art, vendors, dance, fashion, juggling, acrobats, etc. I even saw a group of people dancing with inflatable bananas on the steps of the Wake County Courthouse. The whole street was closed to traffic and artists were working all up and down the road, drawing with chalk pastels. Some of the artwork was very colorful. I think this is supposed to be the building across the street, the Raleigh City Museum. 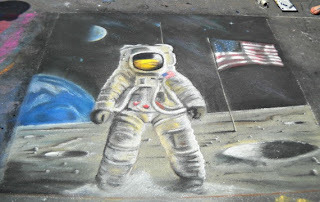 Some of the artwork was simply awesome! Just look at this. 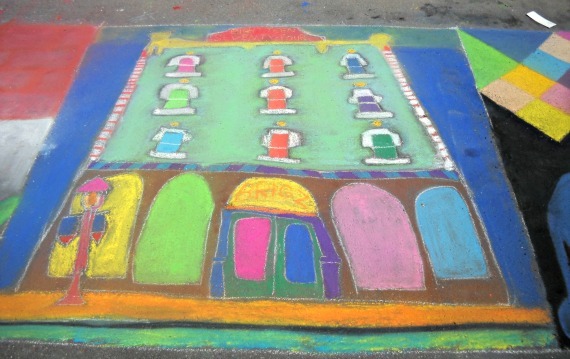 What a shame it will be washed away by the rain. I love it. 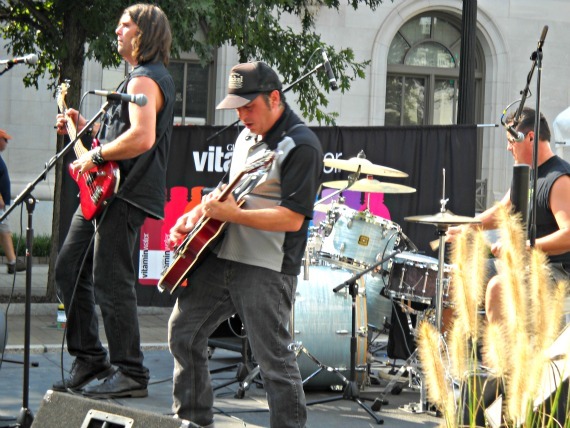 My husband's band, Bubba Joe and the Bruisers, entertained people on the Capitol Stage, while skateboarders did their best on the ramps set up right in front of them. The Bug Fest was going on at the same time, too, on the other side of the Capitol Building, so we went to see that, also. Lots of critters there. Bugs aren't really my thing, but the 2 year old loved it. I made some additional progress on the Log Cabin Pumpkins. This is really going to be finished before Halloween! I made the four leaf blocks. My friend, Pat, from the Quarter Seamers group suggested making the leaf tips a little lighter tint than the leaf bodies. I really like the way that looks. I finished the log cabin part of all the Pumpkin blocks. You can see green squares in a few of the lower corners. Those are going to be stitched and flipped. The blocks sort of fit together like this. I have to finish the pumpkin stems and add the background. 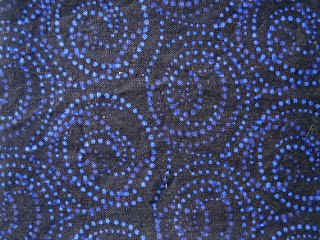 The pattern calls for a light background, but I decided to go with this dark blue swirly fabric. I think it will be more "Halloween-y", kind of like a night sky. 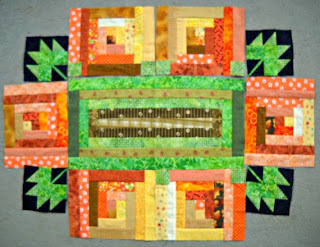 Again, the name of this pattern is Log Cabin Pumpkins, by Suzanne's Art House, if you want to make it, too. Wes brought me home this cute little shelf last week. 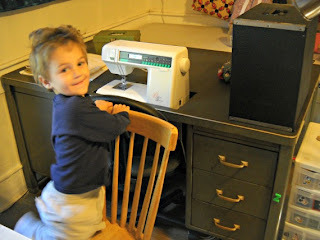 I had him mount it just above a door frame in my studio, and I quickly filled it up with a few miniature irons, some old spools, and a little jar of teeny-tiny 1/4" buttons. I'm lovin' it! 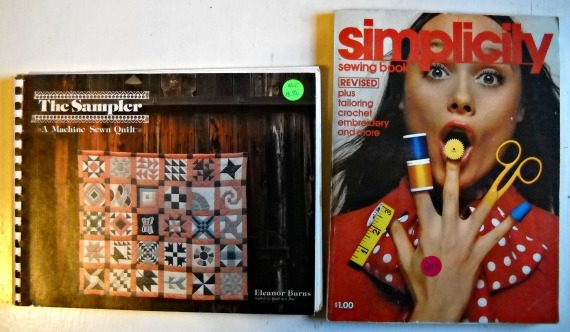 I also picked up these books at the local thrift shop. The first book, "The Sampler" is an old Elanor Burns book from 1982. 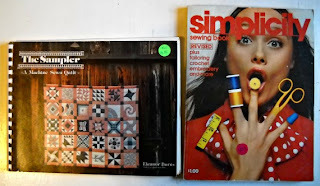 The second book is a Simplicity Sewing Book, vintage 1972. What is going on with that woman's fingers?!!! It's a scary photo. I hope that isn't contagious! 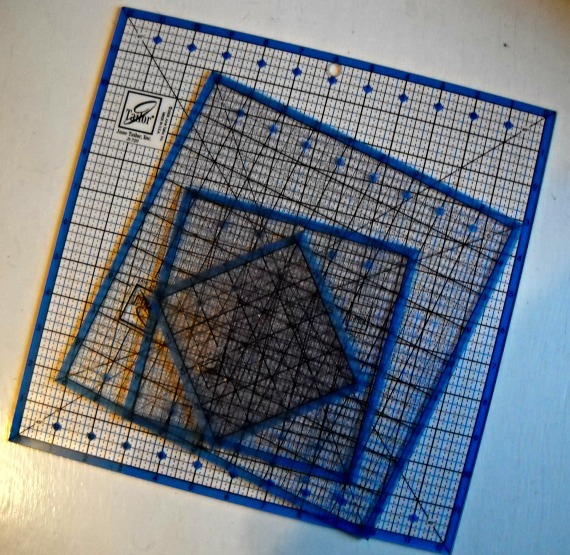 I spotted this four pack of square rulers on clearance at Wal-Mart, and for $13.00, I just had to have them. Even though I'm short on funds this month, I couldn't pass this up. I've been looking for a 12-1/2" square ruler at a good price for a while. That is the size of the largest ruler in this pack. I've been doing a lot of my block designs in this size, so I know it's going to come in handy. Here's some of my new studio. Wes bought me this super-heavy metal desk for my sewing machine and custom cut out the slot to fit my machine. We were able to use the drawer with a few pieces of wood in it for a support for the machine. 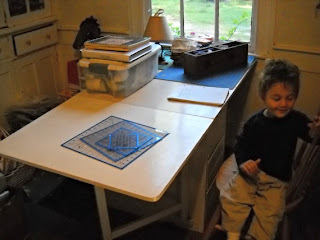 My old fold up table is behind the desk to help support quilts during quilting sessions. I'm going to have to do a few modifications to "pretty up" the desk, but it's super functional at a super price. $10.00 at the local thrift shop. Trent loves to have his picture taken. When I swivel my chair around from the new sewing desk, I have this great vintage wooden table that I just love, right next to the window. It has drawers on both sides of the center section, and a leaf easily folds out on each side. I can use this for cutting and designing. The rest of my mess. However, when I turn around to look at the other side of the room....well...I need to find places for a few things! Ugh! This is the result of yesterday's changes. Where am I going to put all this stuff? LOL! It's better to laugh than to cry, eh? 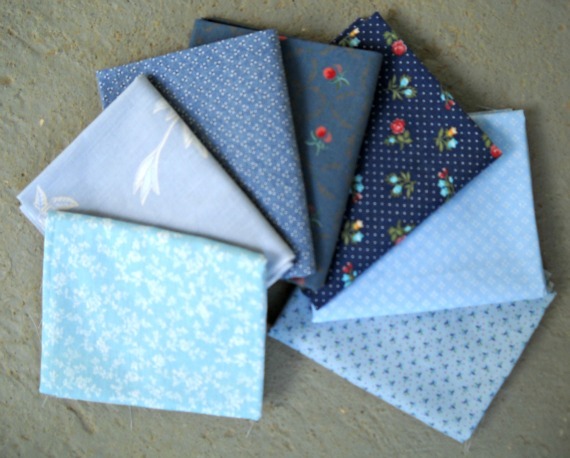 Vintage Fabric Fat Quarter Sampler "Dagana"
Vintage fabrics are fun to collect, but you may be asking yourself, "What can I do with them?" I really enjoy my collection. Modern fabrics are great, too, but the vintage has a special feeling to it. They are like a link to the past, a clue of days gone by. You could enjoy vintage fabrics by simply putting them on display in your home, in a child's rocking chair, as above, or filling some baskets, draped over a bookshelf edge. Simply adding some vintage fabrics and a few quilts to an antique cabinet will add character and charm to your home. 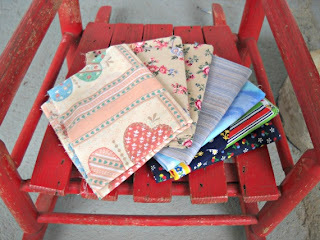 Vintage Fabric Fat Quarter Sampler "Dalit"
You could also collect vintage fabrics to add to your stash. I love this blues collection. 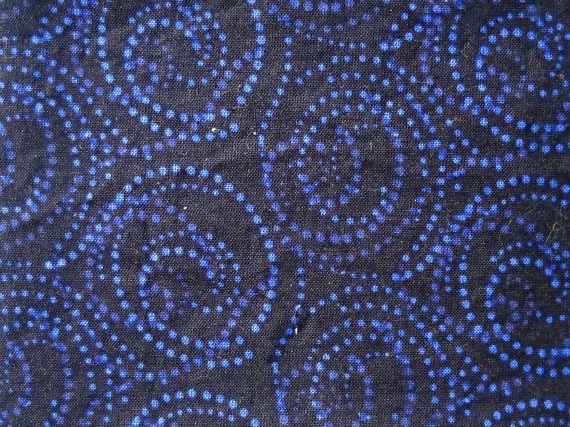 It has a subdued elegance, with the small floral prints, and pretty dots. 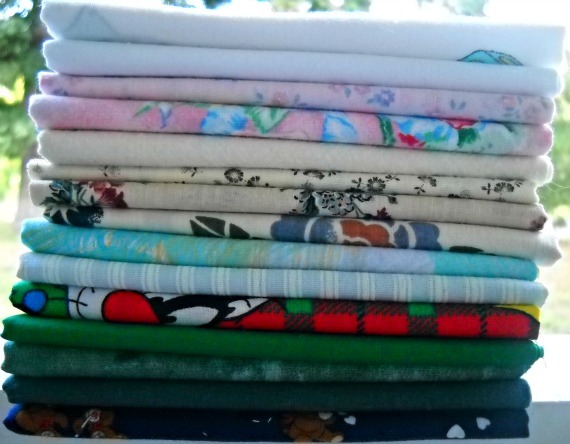 You could use this fat quarter bundle as the anchor for a new quilt. 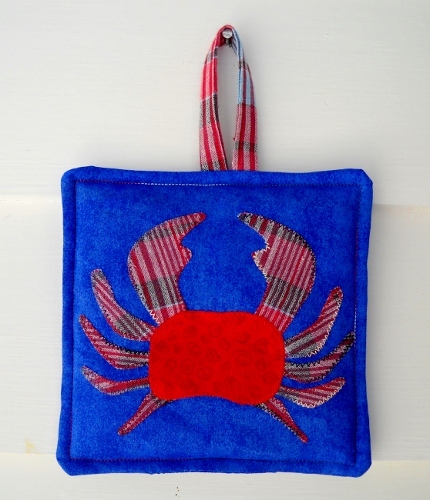 Perhaps a small wall hanging, or a table topper for your kitchen. Mix it up with some whites and get a classic look. 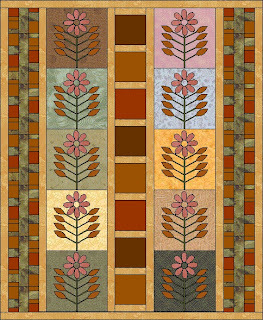 Vintage Fabric Fat Quarter Sampler "Dahlia"
The images on vintage fabrics also make great design ideas. 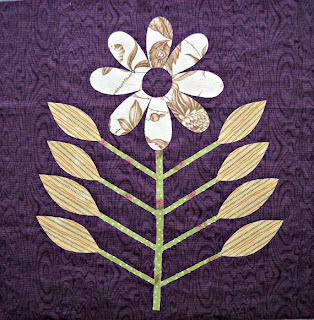 Perhaps an antique floral print could be transformed into a newer, modern, applique design. The colors or prints could be the spark of a new idea, or decorating scheme for your home. Are you longing to create a nostalgic Halloween, or Christmas this year? 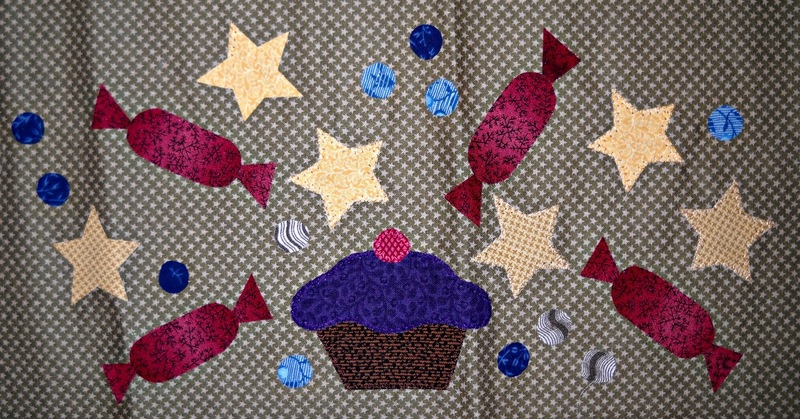 How about a special apron for holiday baking? Vintage fabrics are a great way to start. It's my 100th blog posting today! I can't believe it. Have I really written all this quilty stuff? It's been a great experience. I've made a few updates to celebrate. On the front page of the blog, I've added a few tabs...right up there...under the title. There's a "Home" tab, the "Curlicue Creations" tab takes you directly to the shop, and the "Quilt Patterns" tab shows many of the Curlicue Creations patterns available, along with descriptions of each one. I've also included a tab for my "Fusible Applique Tutorial", featuring the Crabby Crab Pot Holder. 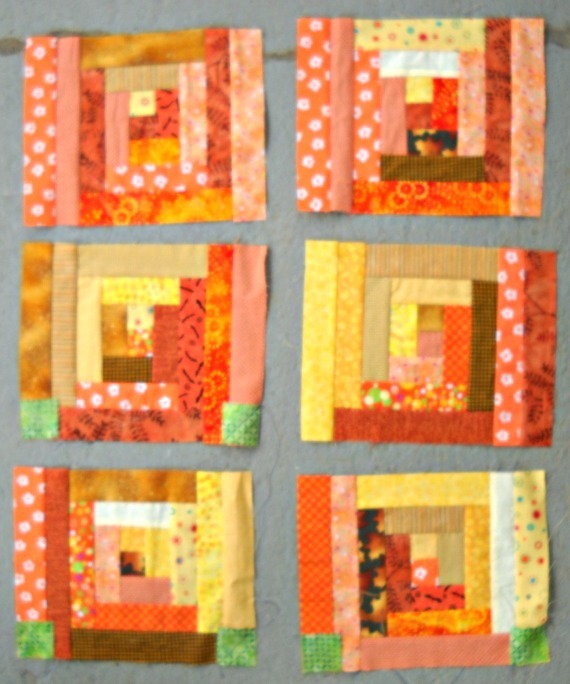 This has been a popular post and my designs are leaning more and more towards the fusible applique method. 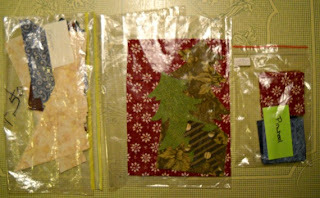 You can "Like" my Facebook page, too, at http://www.facebook.com/curlicuecreations. Take a peek at my Facebook Photo albums. 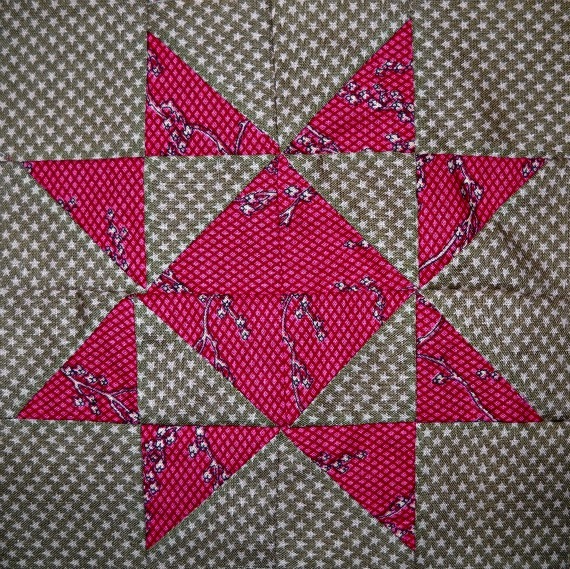 I've been adding tons of quilting photos there. 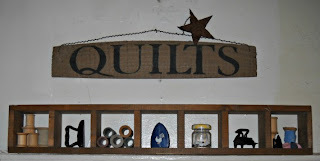 My page is loaded with design inspiration, great quilt photos, humorous quips, and I always share any good quilty giveaways that I come across. 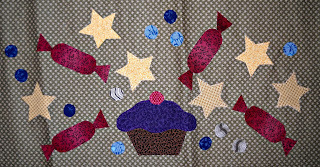 I attended the UFO party at Miss Lou's Quilting Studio, again last month. This time I worked on my Christmas BOM quilt. I may finish this by Christmas 2013! 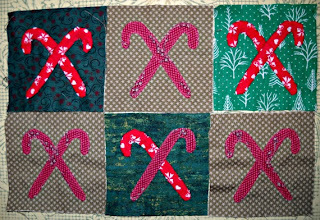 I finished up all the Candy Cane Blocks that evening. I pieced the Variable Star Block. "Finished is better than perfect", as the Dear Jane Janiacs say! I fused all the pieces in place for the Visions of Sugarplums block & started tiny zig-zag stitching around the edges. Adorable block! I made a few more kits for future blocks this week, too. 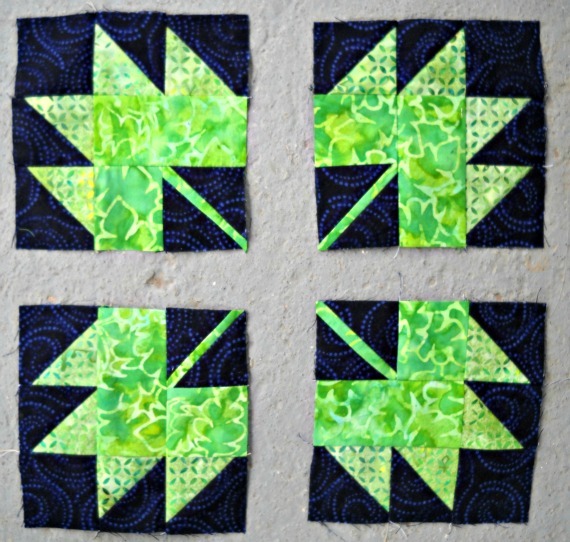 I made a kit for the Church block, the Evergreens block, and some Pinwheel blocks. 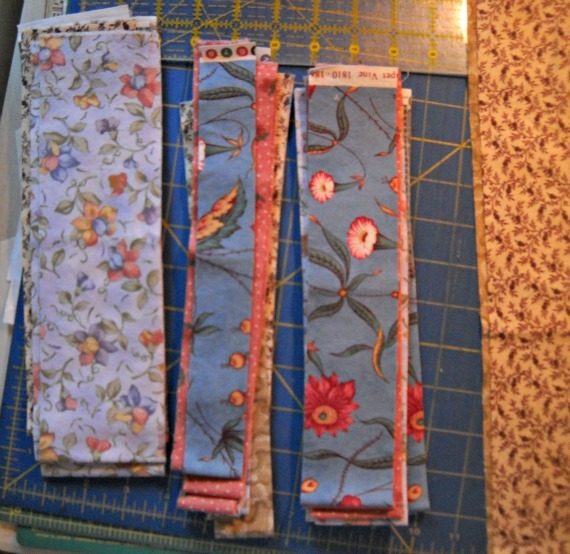 Having the kits all ready to piece or fuse and stitch makes it lots of fun when you sit down to sew. I'm so lucky. My husband is always looking out for me when he's out shopping. And my husband is always out shopping. Look at this vintage handmade quilt he brought home last week. It kind of has a "Sunbonnet Sue" feel to it. It is not all 100 percent cotton. Many different types of fabrics were used. The background and backing fabrics are muslin. The dark reds have bled into the muslin in a few spots. My son is of the opinion that the "Sunbonnets" look like zombies. 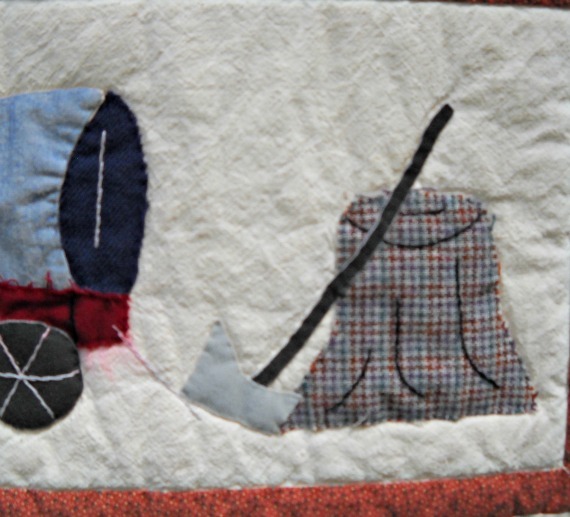 Wesley said he liked the quilt because it has an ax on it. So, ladies, if you want to make a quilt that a man would like, put an ax on it somewhere. LOL! 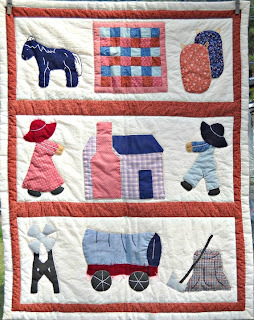 My favorite part is the little quilt. This quilt is another mystery. It has no label to identify the maker, when it was made, why it was made, or what the pictures represent. Perhaps this quilt depicted some one's life. I wish I could hear the story behind the quilt. This is a great example of why we should label and document our quilts. You never know where they will end up. I haven't had a new photo of Pepper Mint for a while. 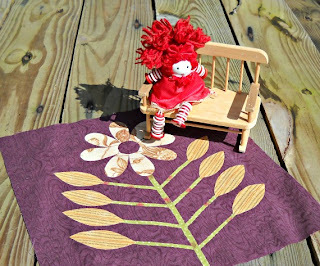 Here she is sitting on her new rocker/bench. Perfect for her front porch if I ever get her house renovated. I'm starting to believe that will not happen until Trent goes to school (another 3 years). 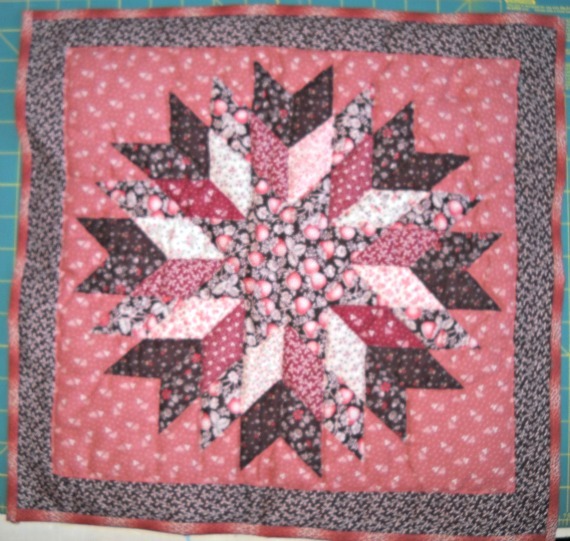 The quilt block is from the latest Curlicue Creations quilt pattern, the Strippy Flowers Quilt. This pattern is available now in the Curlicue Creations Shop. 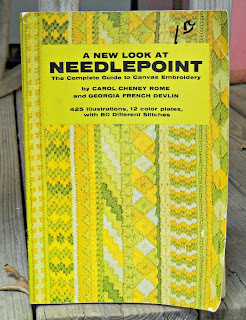 I also got this great vintage Needlepoint book. 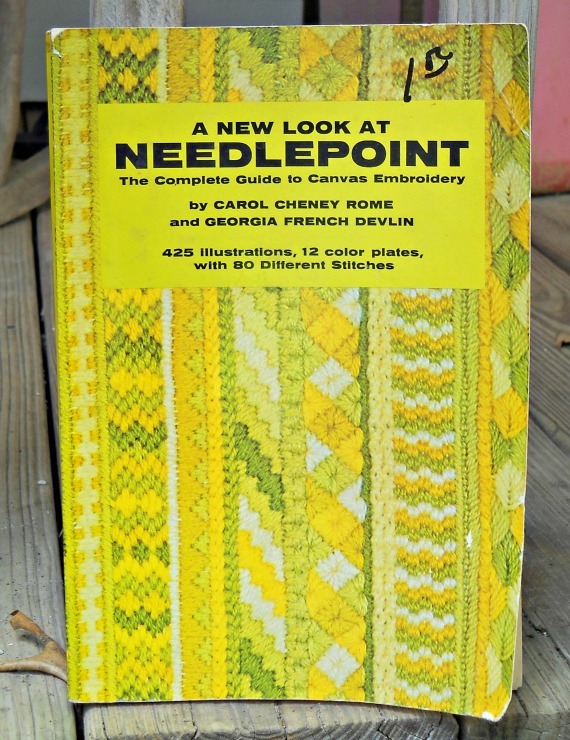 It's from 1972, and has a wealth of information about needlepoint inside. 425 illustrations and 80 different stitches. This has been a lot of fun to look at. 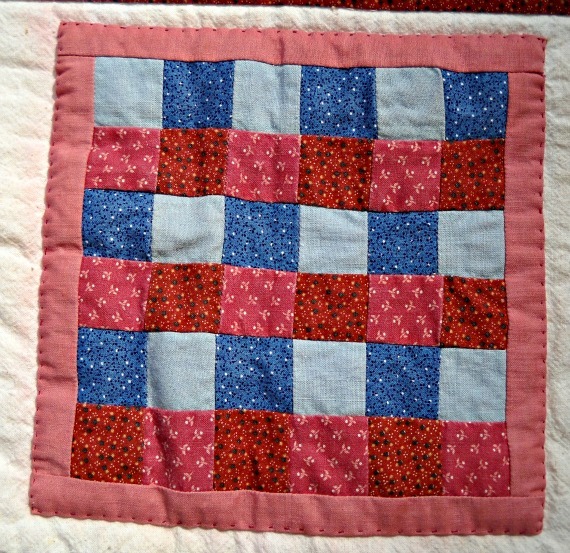 The different needlepoint designs are good inspiration for quilt ideas, too. Here's my latest pattern, the Strippy Flowers Quilt. 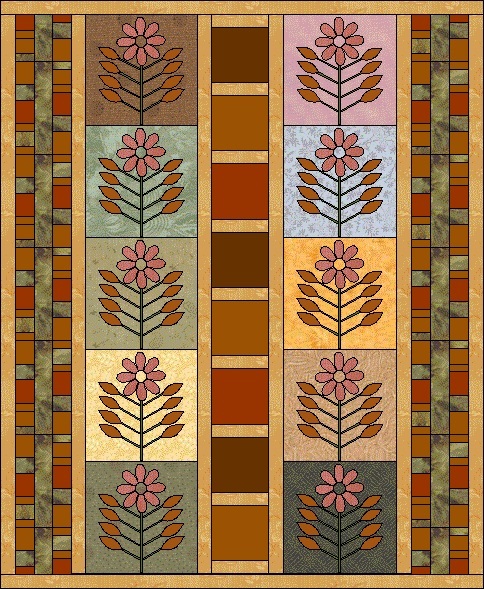 It has a cool, vertical setting, with modern-looking, strippy borders, and 10 fusible appliqued floral blocks. I'm working on my own Strippy Flowers quilt right now! Here's my first Flower Block. 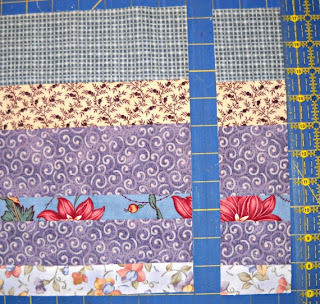 I've done all the fusing, but have yet to zig-zag around the edges. I'm using all fat quarters. Here you can see me cutting the strips to make the borders. 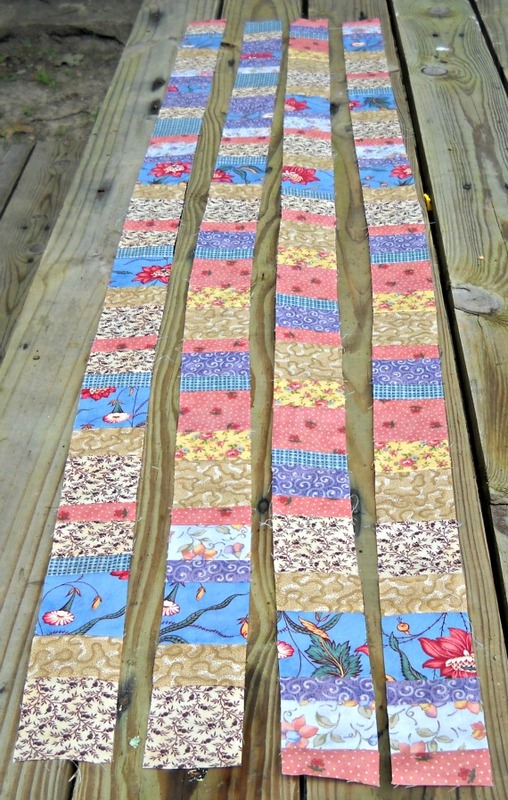 This pic shows some of the strips sewn together and pressed on my - GASP! - dirty looking ironing board cover. I'm sure everyone else has a perfectly clean, non-stained ironing board cover. Maybe I should refrain from taking pictures on the ironing board in the future. This pic shows the strips being cut down into more strips! This is fun! 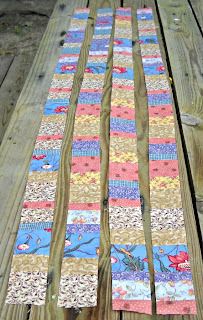 The strips are then sewn together, end to end, to make four long strips. Here they are, all laid out on my picnic table, and receding into the distance. Love it! 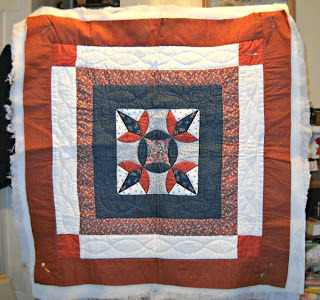 If you would like to work on this quilt with me, the Strippy Flowers Quilt Pattern is available in the Curlicue Creations Shop. Just click on the link above, or visit the shop at curlicuecreations.com and browse the Quilt Patterns Section. 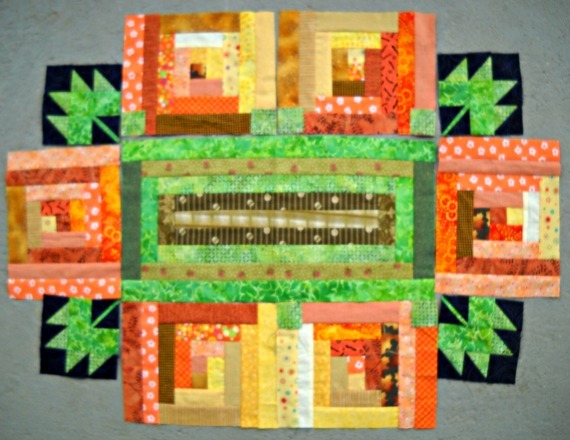 I'd love to have you along on this quilting journey!